Thank you for choosing to support Sunbridge Institute. I am making this gift with deep gratitude, in honor of my Sunbridge family. Every gift to Sunbridge matters. By making a contribution, you play a direct role in enabling us to continue to attract, educate, and develop teachers, leaders, and researchers who will serve in Waldorf classrooms, administrations, and communities nationally and globally. Your financial support allows us to expand our programming, making Sunbridge relevant to new generations and new kinds of students, and to defray our operating expenses, ensuring the future viability of our institute. Annual Fund: Gifts to our annual fund go toward essential operating expenses, including program development, faculty salaries, and outreach activities. Norman Davidson Student Support Fund: Inaugurated in honor of our 50th anniversary, the Norman Davidson Student Support Fund pays tribute to Norman Davidson, Sunbridge’s beloved director of teacher training from 1986 until 1998. Gifts to this fund go toward supporting our teacher education students through scholarship grants, mentor visits, and apprenticeship opportunities. 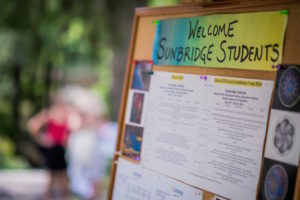 Sunbridge Diversity Fund: The Sunbridge Diversity Fund was established in 2018 for the purpose of expanding and promoting racial awareness and representation in our teacher education programs, thus increasing the number of demographically diverse Waldorf teacher education graduates fully prepared to take on educational and leadership roles in Waldorf classrooms and schools. Gifts to this fund provide scholarship grants for our teacher education students who are people of color, as well as finance projects and programs that promote awareness of racial differences and viewpoints for all within our classroom settings. 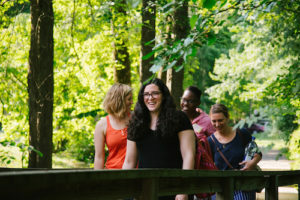 Learn more about this initiative; see our Diversity Fund Scholarship announcement; and read a Renewal article on diversity in the Waldorf movement by Diversity Fund Co-Chair Linda Williams, ’87 PhD. Make a secure gift by credit card. Sustaining gifts provide Sunbridge with important financial support we know we can count on. Please use our donation form to set up a monthly donation or contact Director of Education and Advancement Linda Ogden-Wolgemuth at logden@sunbridge.edu or 845-425-0055 x10 to discuss terms of a multi-year pledge. Many businesses have employee matching gift programs in which the company matches an employee’s gift. If your employer offers such a program, please complete your company’s matching gift form and return it with your gift. You are encouraged to make your gift in tribute to someone or something meaningful in your life. Please specify on our donation form whether your gift is in honor or memory of anyone and we will be happy to let that person know of your thoughtfulness. The Sunbridge Federal Employment Identification Number is 13-3800725. We want to again thank all those who gave to our 2017-18 annual giving campaign; because of your generous support, we exceeded our goal! All 2017-18 donors will be listed in our Annual Report, which will be published by early spring. We also again offer our warmest appreciation to our 2016-17 supporters.